Edward Tilley was a passenger on the Mayflower. He was baptized in Henlow, Bedfordshire, England on 27 May 1588. He was the son Robert and Elizabeth Tilley. Edward was a weaver. He married Ann (or Agnes) Cooper on 20 June 1614 in Henlow. They had no known children. The Tilleys went to Holland a few years after their marriage. In September 1620, they sailed for the New World on the Mayflower with two young relatives of Anne's, Henry Samson and Humility Cooper. 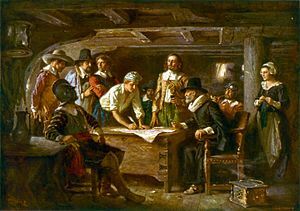 As the Mayflower lay off Cape Cod in November 1620, Tilley and other passengers signed the Mayflower Compact. He and his wife died during the winter of 1620-1621. This page was last changed on 8 December 2013, at 21:21.